Husky digging is one of the problems that this breed is notorious for. Huskies are known to have a natural tendency to dig – it’s in the nature of the breed to dig holes to lie in. They’ve been known to dig up plants and bushes, and under fences to escape. Husky digging can indeed be a frustrating problem, especially if you have flower beds or prized shrubs in your yard. This problem can be overcome by providing a spot in the yard for your Husky to dig in. Huskies mainly dig for one or two reasons. The first and main reason is to get down to cooler, damper soil to lay in. This is why you will see Huskies digging more holes in warmer climates. Dogs do not have many sweat glands throughout their skin, so their main ways of cooling down are through panting and seeking cooler places to lay in. The second reason for Husky digging is part of denning behaviour. In the wild, dogs dig holes to have their pups. They would normally find a closed, dark place in which to have their pups. Dogs love dark, closed places because it makes them feel safe. It is possible, but can be extremely difficult to stop Husky digging completely. Training a Husky not to dig at all would be training him to go against his natural instincts. It’s easy to see why that would be a frustrating task. Even if you do manage to train your Husky not to dig, he may very well do so anyways when the heat is on. A better way to handle Husky digging is to allot a space in your yard where you will encourage your Husky to dig. Either designate a spot in your yard or create a sandbox for your Husky to dig in. Take your Husky to this spot and make his front paws dig there. If you catch your Husky digging in a spot other than his digging spot, correct him with a “No!” and take him to his spot. Praise him when he does start digging there so that he will learn that it’s his digging spot. 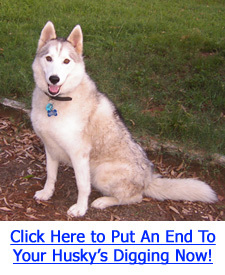 Click Here To Find Out How You Can STOP Your Husky’s Digging Problems For GOOD! Remember that Husky digging is a completely natural behaviour in this breed. Although possible to stop Husky digging, it is very difficult and goes against natural instincts. Instead, redirect your Husky to an appropriate digging spot.